TL;DR Just easy. Well, “just easy” after watching about 20-30 minutes of intro videos. Everything I wanted to be able to do, I could. With options comes complexity; I had to spend some time strategizing how to approach building the model since there were so many paths that would have worked. The plethora of YouTube videos helped. I would not plop a 6 year old down in front of Google SketchUp, but a computer user who has some familiarity with graphics packages shouldn’t have a problem. Oh, and it is a real downloaded software with which I can make files that live only my computer. Didn’t even need a login. And it’s free. They get-ya in the free version by making the import and export options incredibly lousy. But another plus is the scripting language, so there is a plugin for that. 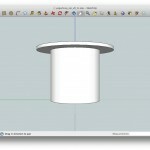 A quick search on the internet yields up more information about working with SketchUp than anyone could possibly consume. 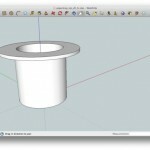 This is the huge SketchUp advantage – it is on version 8. People have been doing this for a while. In the end, the Offset tool and the Push/Pull tool took care of business. While google doesn’t force-publish what you do, they do encourage folks to share what they’ve done in the Google 3D Warehouse. A dialog box pops up and asks you if want to share your model the first time you close a file with anything in it. The Google 3D Warehouse is huge. There is some weirdness with my Google 3D Warehouse login – I have two google logins and I can’t seem to get either of them to show carlynorama as the contributor. Oh well, here is the link. Ideal Object – A building, an chair, a bracelet, whatever. Instashare – From the warehouse, Google Buzz/Reader/Blogger/+, Facebook, Twitter, Digg, Delicious, MySpace, and various embed codes. 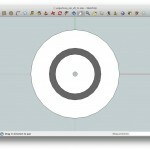 Even for a 3D model version. Community Tutorials – Terrible to Excellent. There are a lot of them.